Welcome to Geocaching! If you still have questions after reviewing our answers to frequently asked questions, you can also search our Knowledgebase or ask a question in the geocaching forums. How do you pronounce Geocaching? You pronounce it Geo-cashing, like cashing a check. What is the meaning of the word Geocaching? The word Geocaching refers to GEO for geography, and to CACHING, the process of hiding a cache. A cache in computer terms is information usually stored in memory to make it faster to retrieve, but the term is also used in hiking/camping as a hiding place for concealing and preserving provisions. Do you have a list of common words and acronyms? Yes, we do have a Glossary of Terms. You can review the list of vocabulary words and acronyms often seen in the world of geocaching. It will help you understand what you read in cache logs ands in the forums. A GPS unit is an electronic device that can determine your approximate location (within around 6 - 20 feet) on the planet. Coordinates are normally given in Latitude and Longitude. You can use the device to navigate from your current location to another location. Some devices have their own maps, built-in electronic compasses, and voice navigation, depending on the complexity of the device. Each GPS receiver is a computer that receives signals broadcast from GPS satellites. A receiver needs to read signals from at least three satellites at a time to calculate its general location by a process called trilateration. With signals from four satellites, a GPS receiver can get a more accurate fix that includes altitude and the exact time, as well as latitude and longitude. The more satellite signals the receiver reads, the more accurate the position it reports to you. If I use a GPS unit can someone track where I am going? No! GPS devices do not actually broadcast your location. The satellites using radio frequencies actually broadcast their own position. Your GPS unit takes that information to figure out where you are (trilateration). Unless you have a tracking system implanted by aliens, you should be safe from the satellites above. As an extra precaution, however, you can put aluminum foil on your head to deflect the "gamma" beams. How much does a GPS unit cost, and where can I buy one? For more information, review our guide to buying GPS Units for Geocaching. 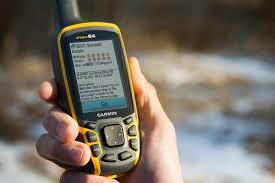 You can usually find GPS units at electronic, camping and boat supply stores. You can also purchase them online. Prefer to use a GPS mobile application on your phone and pay a monthly fee instead? Learn how. How do I use a GPS unit for Geocaching? In order to go geocaching, you will need to understand how to enter waypoints into your GPS device. If you have any questions, try the online forums. There is always someone ready to help. You gave me coordinates to a specific cache location. Seems pretty easy. It is deceptively easy. It is one thing to know where a location is shown on a map; it is another to actually try to arrive at that location. Sometimes you cannot navigate directly to a cache by going straight in the direction your GPS receiver points - there might be a river or other obstacle in the way. It is up to you to find the best route to the cache, remembering to respect the environment and practice Cache In Trash Out along the way. What are the rules in Geocaching? 1. If you take something from the cache, leave something of equal or greater value. 2. Write about your find in the cache logbook. 3. Log your experience at www.geocaching.com. What is usually in a cache? In its simplest form, a cache always contains a logbook. The logbook contains information from the owner of the cache, notes from visitors and can contain much valuable, rewarding, and entertaining information. In smaller caches, a logsheet may be used. Larger caches may contain a logbook and any number of more or less valuable items. These items turn the cache into a true treasure hunt. You never know what the owner or other visitors of the cache may have left there for you to enjoy. Remember, if you take something, it is only fair for you to leave something in return. It is recommended that items in a cache be individually packaged in a clear, zipped plastic bag to protect them from the elements. Quite often you may also find a trackable item. Groundspeak Trackables come in two types: Groundspeak Travel Bugs®, and official Geocoins. A Groundspeak Travel Bug is a trackable tag that you attach to an item, and which travels from cache to cache with the help of people like you. Each tag is etched with a unique code which the finder can use to log its travels on this website. Every Travel Bug has a goal given by its owner, so if you think you can help it along on its journey feel free to take it with you. Geocoins are special trackable coins created by other Geocachers to commemorate special events or as a signature item to leave in caches. They function exactly like Travel Bugs and should be moved to another cache unless otherwise specified by their owners. The variety of different geocoins is staggering! More information about Travel Bugs and Geocoins can be found on the Groundspeak Trackables page. What should not be placed in a cache? People of all ages hide and seek caches, so think carefully before placing an item into a cache. Explosives, ammunition, knives, drugs and alcohol should not be placed in a cache. Respect the local laws. Food items are always a bad idea. Animals have better noses than humans, and in some cases caches have been chewed through and destroyed because of food items in a cache. Please do not put food in a cache. It is common for geocachers to hide caches in locations that are important to them, reflecting a special interest or skill of the cache owner. These unique locations on the planet can be quite diverse. Make sure to read the cache descriptions carefully, especially the difficulty and terrain ratings as some cache finds can be technical and physically challenging. Even the skillful placement of a small logbook in an urban environment may be quite challenging to find even with the accuracy of a GPS. Have fun and remember to share your geocaching experiences online. Do not move a cache from its original location. If you feel that the cache may not be located in the correct location, please email the cache owner directly or post a log on the cache detail page, notifying the owner of your concern. It is an owner's responsibility to maintain cache placement. Yes! Geocaching is an activity that continues to evolve and mature with community commitment and participation. If you have a new idea that incorporates the use of GPS, we would love to hear about it. View the list of Geocache Types to see how the activity has evolved from the original, traditional geocache. How do I hide a cache? Before considering your first geocache hide, find a variety of caches in your area to familiarize yourself with the activity. Then, review our Guide to Hiding a Cache and the Geocache Listing Guidelines before submitting a cache for review. When I submit a new cache for publication, how long will it take to be listed? Each cache that is submitted to Geocaching.com is reviewed by a volunteer, to ensure that the cache meets the Geocaching Listing Guidelines. This process may take up to 72 hours to have your cache posted to the web site. We kindly ask for your patience during this review, especially on weekends when site traffic can be high. Does Geocaching.com or a volunteer physically check the cache before publishing it? We rely on the geocaching community to abide by the geocaching guidelines, to ensure that permission for cache placement has been sought, to provide accurate coordinates, and to keep the contents appropriate for a family-friendly audience. If you find a problematic cache, please contact the owner directly or contact us. What do I do if I find out that a cache has gone missing? If you visit a cache location and the cache is missing, make sure to log the cache as one that you "Did Not Find" so the cache owner is notified. Cache owners who repeatedly receive "Did Not Find" logs should check to see that their cache has not been removed. As a geocacher, if you notice that a cache detail page has an unusual number of "Did Not Find" logs, please let the local reviewer know or contact us. We rely on the geocaching community to let us know the status of caches in their area. Do you have an FRS/PMR channel to find out if other Geocachers are in the area? Yes. The community has decided on channel 2 as the primary for both FRS and PMR, and 12 as the alternate FRS (Family Radio Service) channel and 8 for the alternate PMR (Europe). FRS and PMR radios are longer distance walkie talkies, like the Motorola Talkabout.